What was the best gift someone has given you? Surprisingly, it does not depend on the amount spent on the gift, but how much love was in the gift. This year, we ask you to give a gift from your heart that will change a child’s life. The ethnic minority Hmongs live at the foot of a mountain in KomTum Central Highlands. Because many trees have been cut from the mountain, there was nothing to hold the rain water during the monsoon season. Unfortunately, there was a huge mudslide, and their village was buried. The mudslide also destroyed the only bridge they had of crossing a river into civilization. Now to cross, the people have to walk in waist to chest deep fast-current water to the other side, holding their belongings on their head. They have no food, and the children have no way to go to school. The children were sent to live in a Catholic church across the river. The church has sixty-five displaced children. The children walk more than ten miles each way to school on rough, unpaved road. The Foundation for Children of Vietnam would like to get mountain bicycles for these children, and we need your help. For a tax-deductible $50 donation, we will send you a picture of a child that received your bicycle gift, holding a sign with your name. Each bicycle will also have a sticker with your name to remind the child of your love and kindness. Each child will get a new T-shirt, as most of these children do not have a change of clothing. This holiday season, please give the gift a child will remember as the best gift. Please give your gift of life-changing love. Bicycle Mission Trip was a big success! Ha Tien is an eight-hour bus ride from Saigon southwest to the Cambodian border. Here lives the Vietnamese-Cambodian ethnic minority. The children would walk 4-5 hours to get to school. They carry enough food for 3-4 days, sleep on the school floor, and walk home when the food is gone. The school is poorly equipped for the 600 children that attend there: 1 bathroom for the girls, 1 for the boys and 1 for the teachers. Many children cannot go to school because their families need them for daily chores. If they had bicycles, it would take them 1-2 hours each way, which is a do-able daily commute, and they can use the bikes to run errands, go to the market, etc. The cost of each bike is $50. 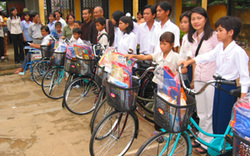 ChildrenVietnam began soliciting for donations and we received 170 bike donations! On Sunday January 17, 2011, eight volunteers headed for Ha Tien before sunrise. At 5am, the driver of the truck carrying the bicycles called and said he had been arrested and the truck had been confiscated. One truck carrying the bikes got through, but one was detained by the police. They believed we were selling bikes illegally because we didn’t have the bill of sale. The driver explained it was for charity, but they didn’t believe him. Our volunteer called the school principal, and he talked to the police chief and confirmed the bikes are for poor students. Not a sale. They finally released the driver and bikes. We planned to give the bikes at three different schools, and the trucks would drop some bikes off at each school. When the bikes were put on the trucks, to save space, they did not assemble the pedals, so they can fit more bikes into the trucks. When they dropped the bikes off, they did not drop off the right number of right and left pedals at each school, so one school got more left than right pedals. The schools were too far apart to go and retrieve the correct pedals, so they scrambled to find local bike shops to buy the pedals. They also had to bring someone from the bike shops to the schools to put the pedals on, because no one had the right tools. When we arrived at the school Monday morning the bikes were all neatly in a row. The school had to hire a security guard to sleep with the bikes so they wouldn’t “pedal off” overnight. The bikes were still wrapped in plastic (thankfully with pedals attached), so we hurried to unwrap them while the children anxiously waited. Each bike had a sticker “Gift of ___” and a sign with the donor’s name for the child to hold so we can take a picture and give it to the bike donor. The TV reporter was there, and they interviewed me, in Vietnamese! I gave a little speech to the children, telling them that some people half the world away cared about them and helped them, even though these people don’t know who they are. They should do good things with the bike and it’s now their turn to help others, big or small things. I’m hoping to turn every child into a charity organizer! One mom told us that when her daughter found out she was selected by the school to receive the bike a month ago, she couldn’t sleep. It was the longest month of her life. She had trouble sleeping many nights. She couldn’t sleep at all the night before. She got to school three hours before the bike ceremony. At the second school, the kids are so poor they can’t afford to wear uniforms. They were mostly barefoot and very dirty. One volunteer asked the school principal to tell the children to wear their “Sunday best” for the bike ceremony. The principal explained that they don’t have any other clothes, and the clothes we see them wearing they have to share with their siblings and neighbors. Their clothes are worse than rags we throw out after cleaning. The principal asked if we could give these children some clothes next time. The teachers are very kind, they tell us we share the same mission, and they didn’t ask for anything for themselves, even though they make only $100/month. Our volunteer told the children when he interviewed them they must be present to receive their bike. If they are not there, the bike will be given to another child. At this school, one girl didn’t show. They asked me what I wanted to do. I said Let’s try to find her first. She lives in a thatch-roof hut not accessible by motorbike and very far away, because we asked one of the people at the school to drive to her house to find her. We offered to pay for his service, but he didn’t want to leave his motorbike unattended in the middle of nowhere and walk to the girl’s house. Luckily, the principal was able to call another student that lives nearby, and forty five minutes later, the girl comes running. When the neighbor told her there’s a bike waiting for her, her parents ran down to the road and got a motorbike taxi to take them to the school. She heard we were giving the bikes out at the other school in the morning, so she went there instead. She didn’t know we were also going to be at her school. She waited all morning at the wrong school, but I didn’t call her name. The school closed after the morning session (children only go either morning or afternoon), and she went home crying. She was still crying when the neighbor came to tell her the good news. We already had the bike ceremony but we kept the bike for her. As she pushed the bike out for picture-taking, we noticed the chain was loose. We said Let us tighten the chain for you. She wouldn’t let go of the bike. We fixed her bike while she held onto the handlebars. Many of these children cannot speak Vietnamese well. They are terrified of the local authorities. They never speak out, no matter how unfair things are. One boy almost cried when our volunteer interviewed him for the bike, asking him where he lives, his parents’ names, etc. He thought our volunteer was the police and that he was going to take his parents away. As we headed back to Saigon, we passed a row of children proudly riding brand new bikes alongside us. We got back late Monday night. We were exhausted; the roads were bumpy; but everyone feels happy and satisfied. It was a great reward for all our hard work.